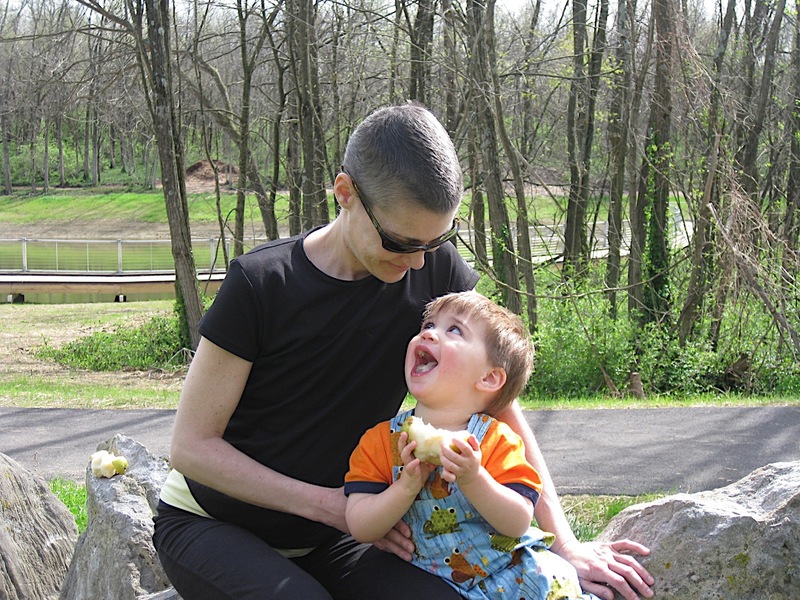 May 14th, will mark the 7th anniversary of our daughter’s passing from breast cancer. Kelly was only 37 years old. Statistically speaking, one in eight women will be diagnosed with invasive breast cancer; a statistic I’d rather not know. 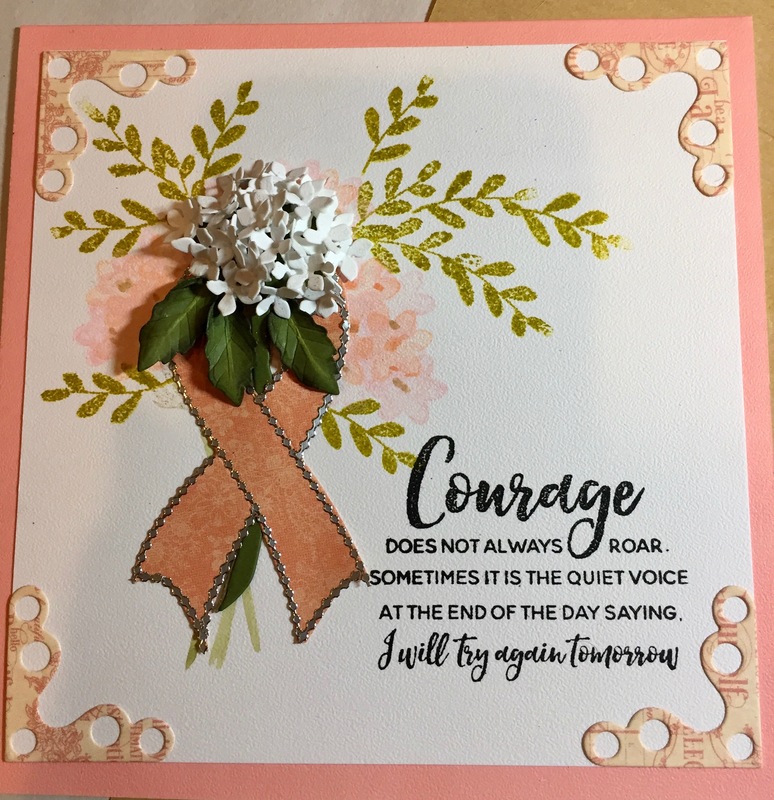 Today, I created a card, using my Garden Notes Hydrangea 2 and a wonderful set of dies and stamps I purchased at Ellen Hutson, LLC – “Courage Stamp & Die Set” to benefit Breast Cancer Research Foundation. Half the cost of the stamps goes to this foundation. 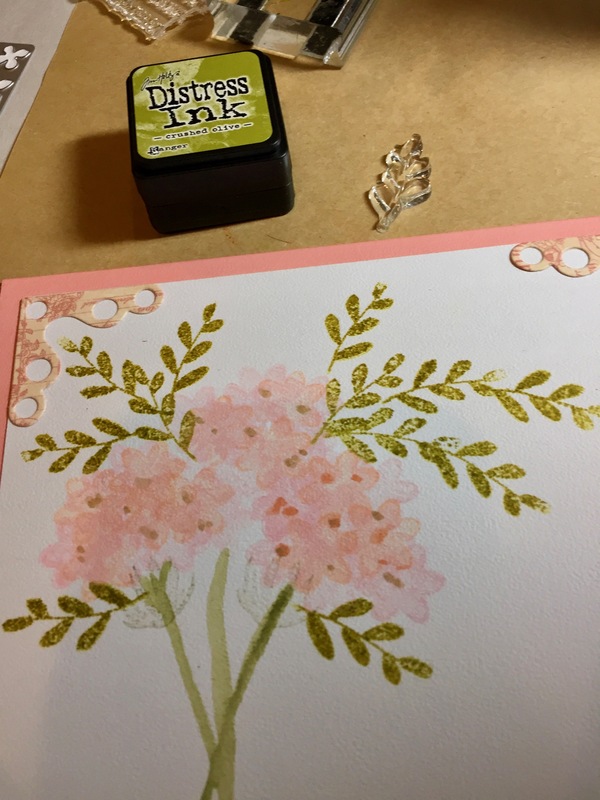 I chose to do the card in shades of a pinky-peach because Kelly said to me once, “Mom, I really don’t like Pink…I wish the color was orange!” However, hydrangeas were one of her favorite flowers and I have a garden area I’ve planted dedicated to Kelly with hydrangeas and other flowers she loved. It brings me peace and happiness amidst the loss of a beautiful soul. First, I cut Colored Soft Finish cardstock, Pink Peach, to a 6″ x 12″ piece. Fold in half to create a bottom-fold 6″ x 6″ card. The second layer is Soft Finish 85 lb. white cardstock and trimmed to 5 1/2″ x 5 1/2″. I die cut the Ribbon and Corners 1 in Graphic 45’s “Portrait of a Lady.” Garden Notes Hydrangea 2’s stem/head is die cut in a medium green 80 lb. cardstock and also, 100 lb. lighter green cardstock. Die cut the petal plate twice in Soft Finish 85 lb. White cardstock to give you enough to fill the head of the flower. 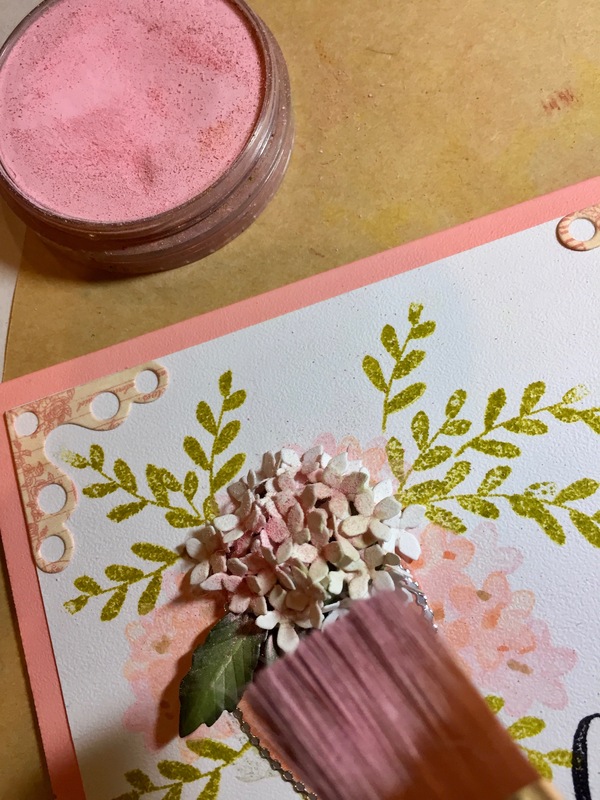 I used one of the flowers from the “Courage Stamp & Die Set” and VersaMagic “Pixie Dust” and “Persimmon” chalk ink to create a background bouquet. 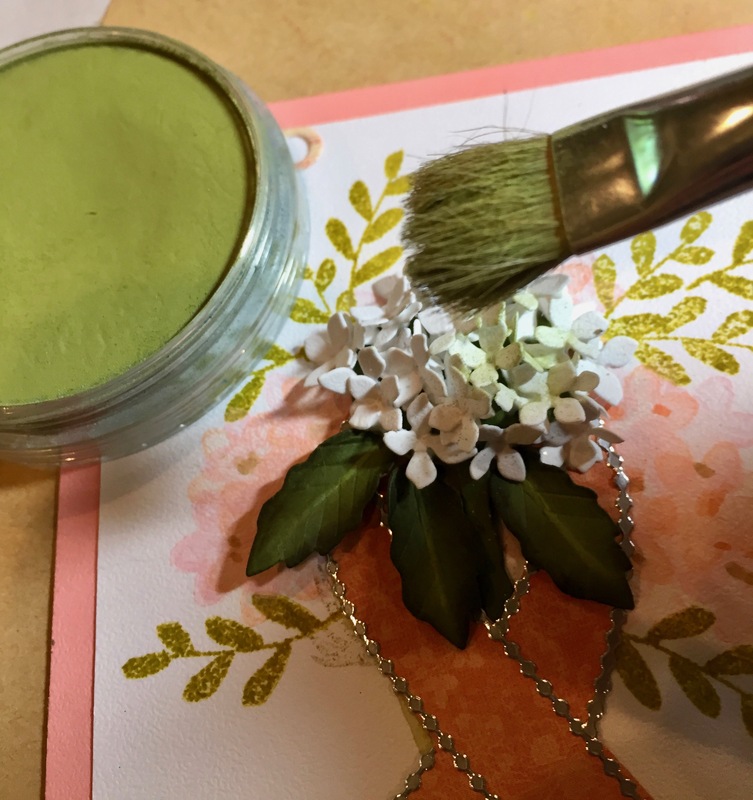 I used a Leaf from the Set with Distress Ink/Crushed Olive for “foliage”. Finally, with a bit of watercolor, I extended some stems down. I assemble the stem/head of the Hydrangea, then placed it on the Molding Mat and used the Medium Ball Stylus to shape the head. It was placed down through the Ribbon and I secured the head with Beacons Kid Choice glue, just around the edges, so you don’t loose the shaping. 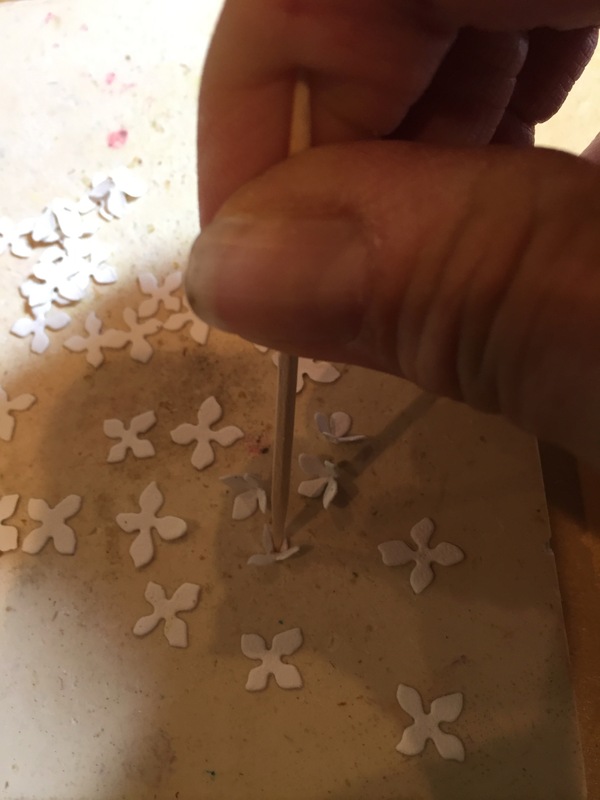 Place the individual petals on the Molding Mat or as I use, a “carving block” because it gives a firmer surface. I also use a round toothpick to cup the centers. I also stamped one of the quotes from the Set that best described Kelly’s fight in VersaFine/Black ink. 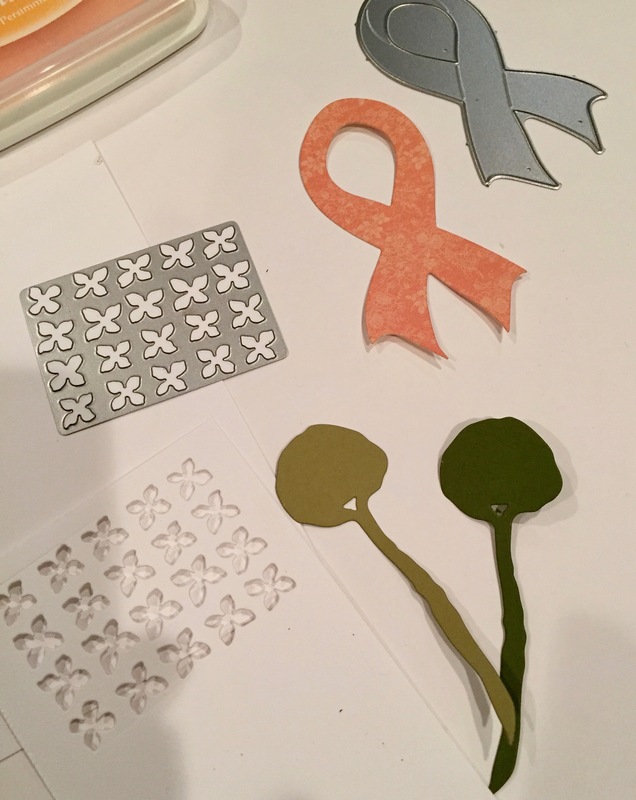 I also added Starform Stickers/Silver to outline the Ribbon. 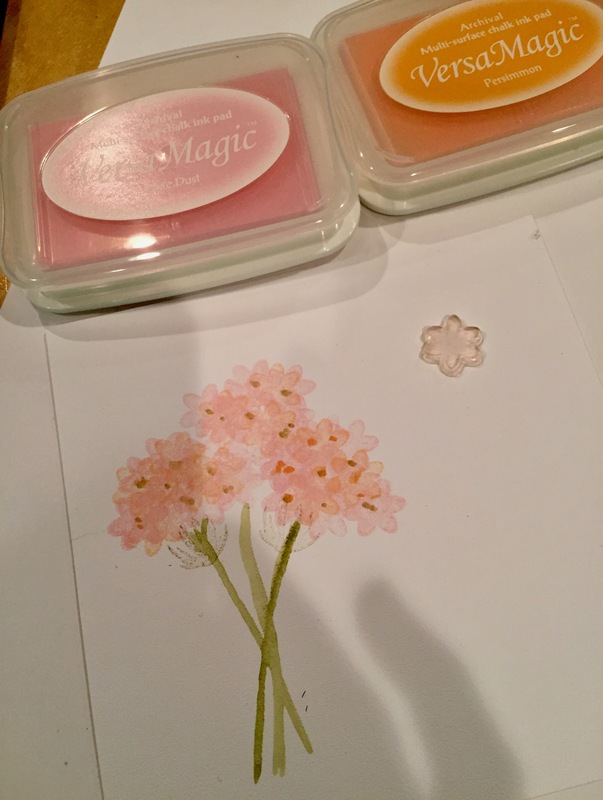 Once the flower petals have set a bit (about 10 minutes) use PanPastels to “pouch” on color. I use Bright Yellow Green from Set 2 and Permanent Red Tint (Pink) from Set 1. “Cancer Divides, We Unite.” Sadly, I know many of us have gone through this personally with a mother, sister, aunt, or a dear friend. Please consider donating and let’s see a cure; something I work for everyday of my life. What a beautiful way to remember your daughter, Susan. Thinking of her with you, as always. My heart ❤️ goes out to you. You honour your daughter so graciously with the things she loved. Being in the garden has such beautiful memories with my daughter. Thank you for your comment. I’m so so sorry for your loss. Cancer is so scary. My mom has cancer, it s,axes me we can leave the planet but can’t cure this nightmare. Bless you for be a survivor and I pray too that a cure is in sight. What a beautiful card. Did not know. Sorry you are having to go through this. God bless for sharing with all of us. You do terrific work. I am so sorry for your loss. 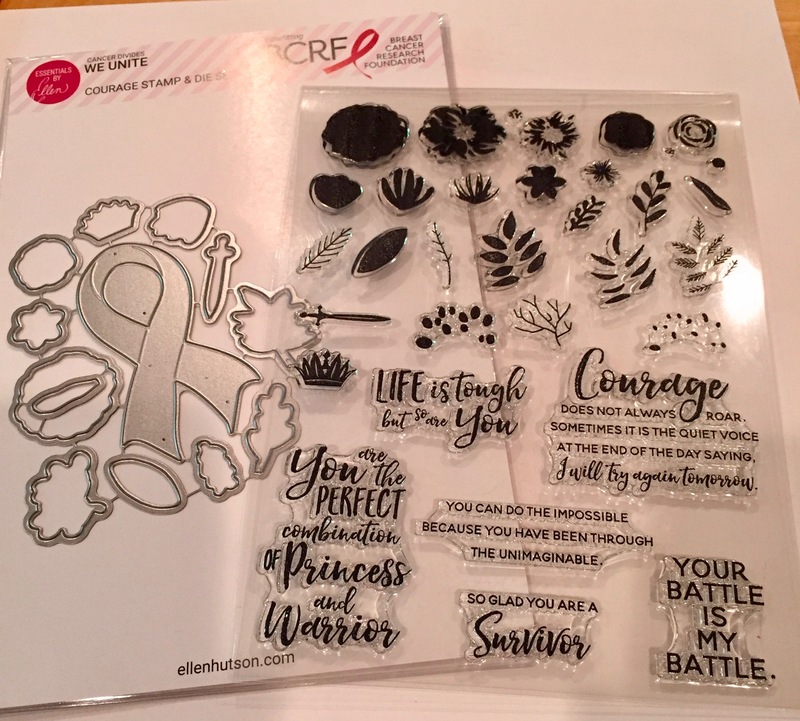 I, too, am a survivor of breast cancer twice. Such a lovely card! Oh Susan, I did not know about your loss. I so admire your strength. This card is a beauty! Beautiful! Kelly must be smiling today. You honor her with such grace and beauty. Thanks for sharing her memory with us. 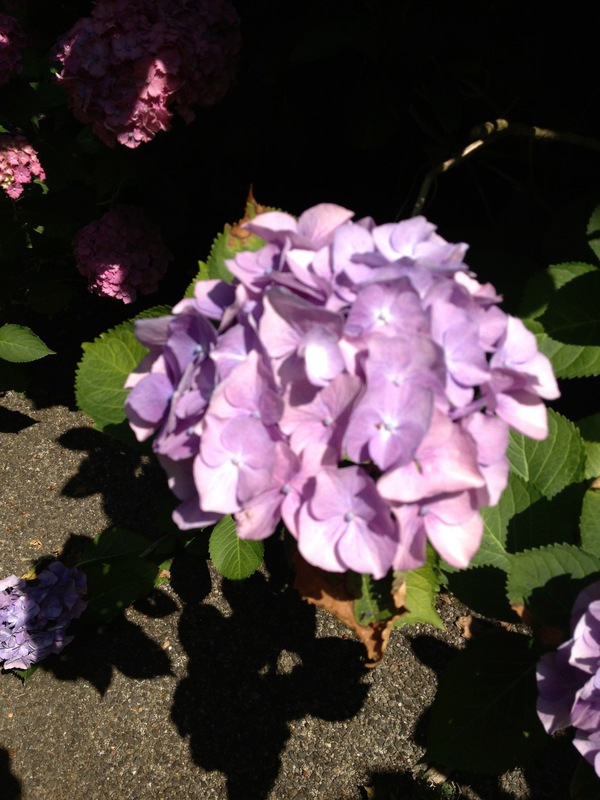 I’m so glad you have the garden and equally glade you design flowers. I am having a grand time learning to ‘grow’ Susans Garden flowers. Susan, this is such a beautiful card and message. I love that you have a place in your garden to remember Kelly by. Big hugs to you. What a beautiful way to remember your daughter! I am so sorry for your loss. I can understand your loss as I, too lost my 32 year old son 7 years ago to depression. The wound never heals but the thoughtful ways that you have chosen to remember your daughter lets her memory live on! You are in my thoughts!